A month ago I was privileged to be part of a panel titled “Rethinking Primary Sources for the Music History Classroom” at the annual meeting of the American Musicological Society. It was more of a workshop than a panel, as the four presenters had each brought an assignment we have used with our classes, and the audience then did the assignment. I picked up a lot of good ideas from the other panelists. 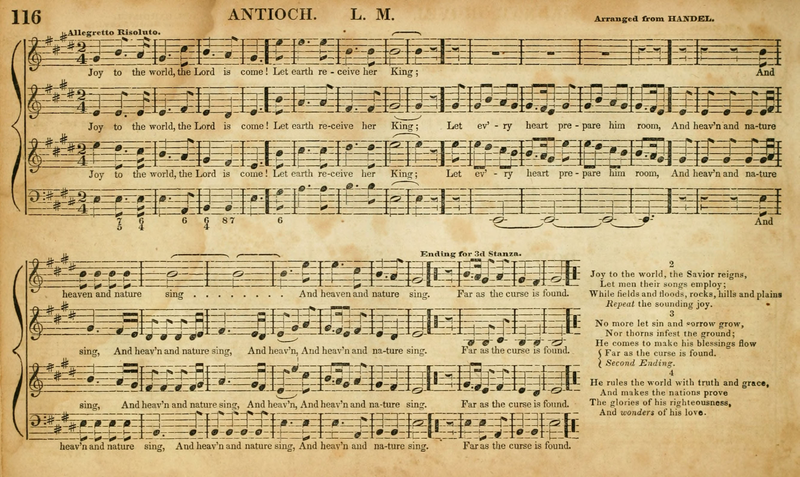 I was there to talk about musical texts—specifically how I try to get my students to be more aware of how a musical text gets to be the way it is—and that many (sometimes well-meaning) hands may interfere. Below I will describe the assignment I presented, but I will digress here to mention its inspiration. My father was also a college professor. His degree was in ancient near eastern archaeology, but working at a small college meant that he ended up teaching across the history curriculum, as well as classics and religion. By the end of his career, most of his time was consumed teaching Hebrew and the Hebraic scriptures in the seminary that shared the campus with the college. For one of his courses there he designed an assignment that he referred to as “the fish”—and it was one that his former students continue to talk about (whenever I run into them) more than ten years after his death. In fact, my father didn’t care what solution a student came up with for the textual difficulties this assignment compelled them to confront. There was no one “right answer.” The point was the confrontation itself. These were students intending to enter the Christian ministry, and he thought it was crucially important that they be confronted with real textual difficulties in the Bible. The dates don’t line up. Some students, he told me, would perform all manner of mathematical gymnastics to establish that every syllable of the Holy Writ available to them was inerrant. At the other extreme, some students’ reaction was “to hell with it.” It did not matter to my father where the students placed themselves on that continuum, but he wanted them to become aware of their attitude toward the text itself. It seems like a descent from the sublime to the trivial to lay out my own “fish” assignment, as mine is aimed at nothing more than raising my students’ consciousness of textual issues at all. Where my father was throwing his students into the deep end, my assignment was just a chance for mine to get their feet wet in the philological wading pool. But I hope it sticks—that it makes them view any musical text put before them thereafter with a little skepticism: Why is it thus? How did it get that way? There are many ways one might approach such an assignment. I commend to your attention Rachel Scott’s interesting article treating edition selection as a way of teaching information literacy, and particularly the worksheet she suggests as a pedagogical method. My own assignment is a practical assignment of a different sort, but also requires an examination of multiple sources of the same musical work. 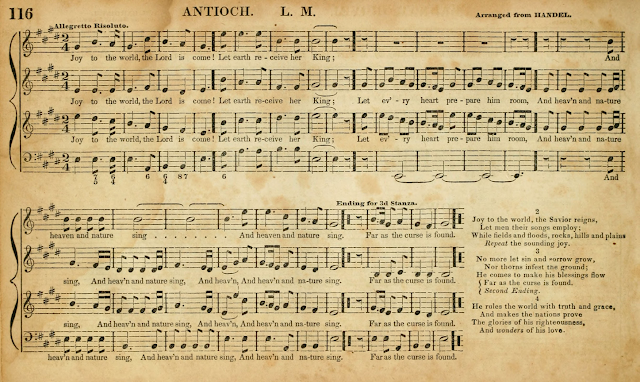 if you find a hymn-tune that is generally familiar outside of the church, students may more readily grasp the relevance of otherwise esoteric textual issues to “real” musical life. I thus make clear to my students that they have a very incomplete data set. From the dozens they might look at, I ask for only eight. Then, however, they are expected to take those eight and treat them as the sole surviving sources, collating the readings and then trying to connect them in any ways they can. I call the assignment “armchair philology” because they are spared the trouble of finding recalcitrant sources, and there are no consequences to ignoring all the evidence beyond their eight selections. 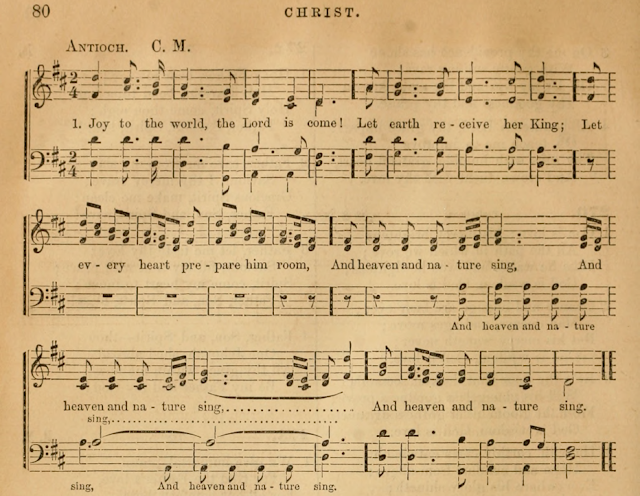 While it is clear that The Southern Harmony version is taken from Carmina Sacra—it even gives the attribution—there is a substantial change in the musical text: where Carmina Sacra gives a four-part texture (with the melody on the staff directly above the bass, as is customary in such sources), The Southern Harmony only gives three parts, deleting the second staff of Carmina Sacra. 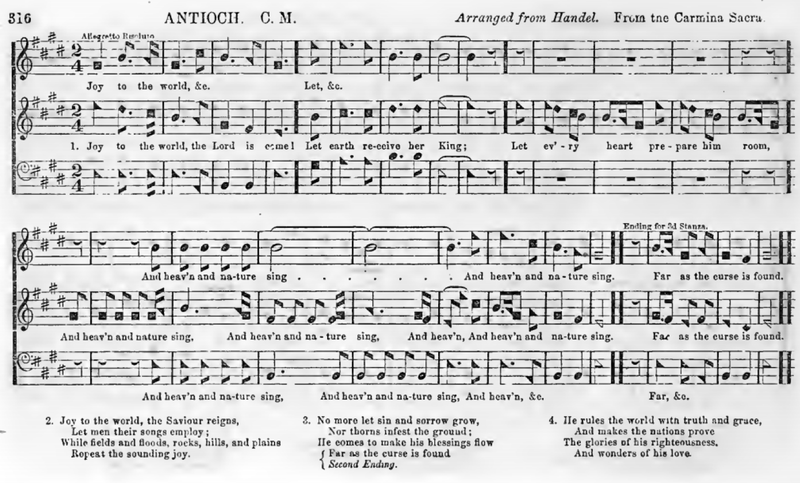 There are a few other changes: SH translates everything into shaped notes; omits the sustained accompanying bass note in the third phrase of CS—also deleting the figured bass (that only show up in the first few bars of CS anyway). 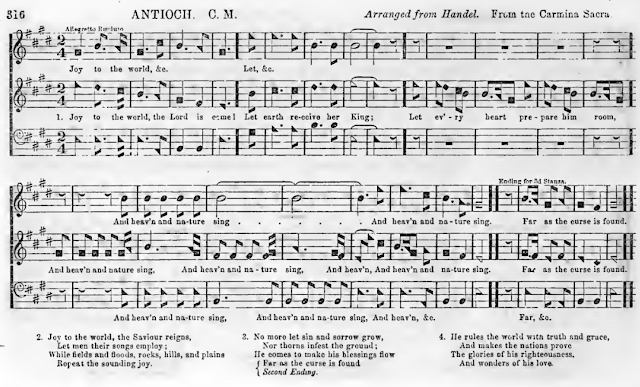 Both of these sources transmit a slight variant in Watts’s hymn, beginning the second stanza with "Joy to the world" instead of his original “Joy to the earth.” They also preserve an archaic variant ending for the end of stanza 3: rather than gleeful repetitions of the extent of the taint of original sin (“far as the curse is found! far as the curse is found! far as, far as the curse is found!”), this version truncates the verse abruptly to get on with the good news. 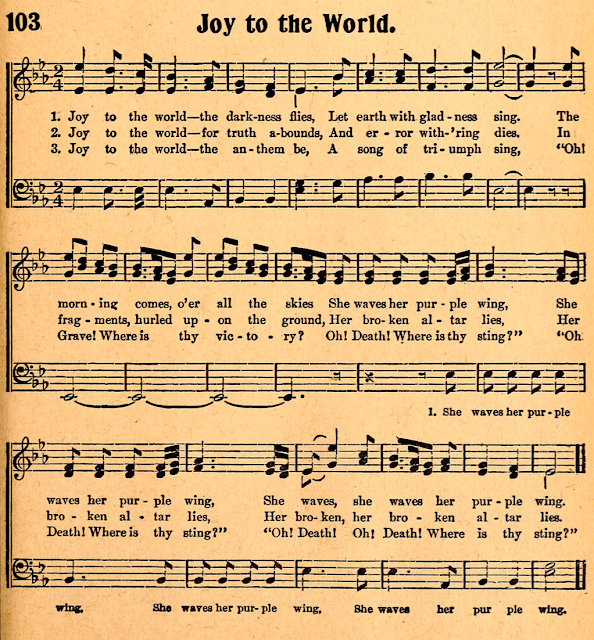 The version of Songs of Summerland (1943)—a Seventh Day Adventist publication far removed in time from either of the nineteenth century sources above—is also directly connected to this line of transmission, notwithstanding the very different lyric to which it is set. Like SH, Sum conveys only a three-part texture derived from the reading given in CS, but this time it is the top staff of CS that is omitted; and of course in Sum it is reworked into a melody-at-the-top format. (The added “tenor” third in the final chord is surely editorial.) 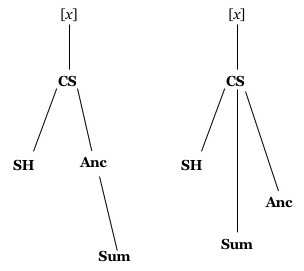 My students could thus determine that, whether or not CS was the direct source for Sum (as there may be other sources in between, or they may share a common ancestor), Sum could not possibly be derived from SH. If we had only these three data points—our stemma would be like the one at right. 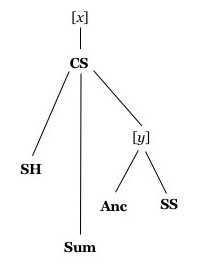 Adding a fourth source naturally complicates the stemma, even when it too is clearly connected to the same line of transmission, with the same basic harmonization. 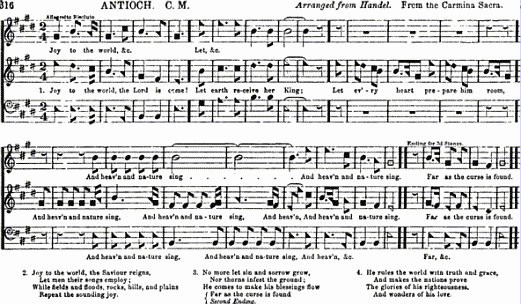 Indeed, except for an apparent error (tenor voice, first note of b. 2), this is the same harmonization presented in CS. 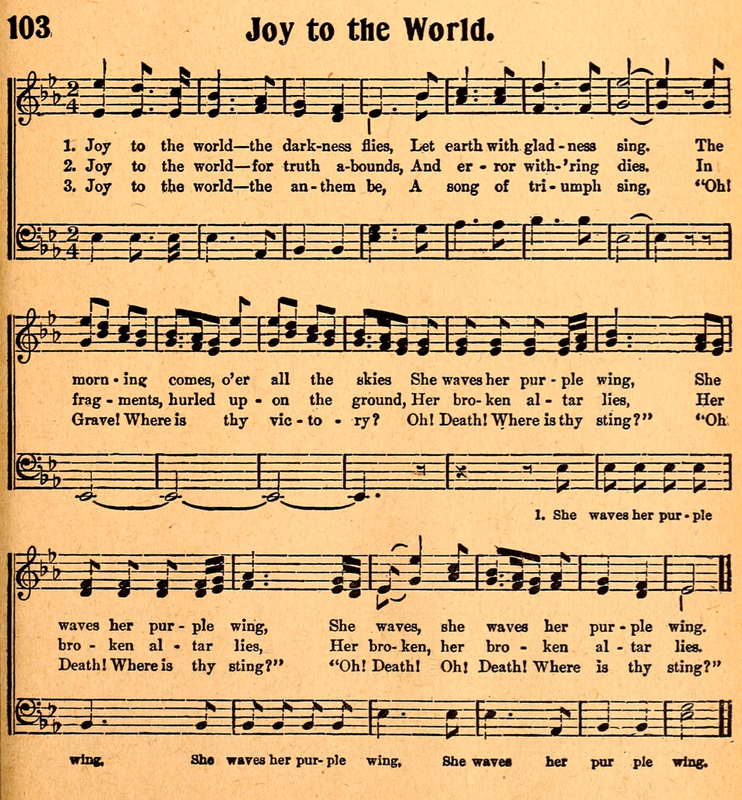 Like SH, the sustained bass of the third phrase has been eliminated; like Sum, the format is modernized to put the melody at the top; a tiny variant occurs in the penultimate bar in the tenor, where the introduction of an eighth note allows all voices to change syllables at the same time, but does not affect the harmony. None of these, save perhaps the first, is substantial enough to require the stemma to posit any number of hypothetical lost sources (even though we know that many such sources have not been consulted for this exercise). Thus whether one favors the stemma on the right or the one on the left depends on how likely the elimination of the sustained bass tone was arrived at independently. It is my contention that Agassiz’s scientific dictum should be the creed of any text critic: “Facts are stupid things until brought into connection with some general law.” A variant reading may be curious, but it is no more than that until it can be explained as part of a larger scheme. The critic’s task is not merely the mechanical listing of variants, but rather the creative connection of the dots to propose some pattern. And anyone can learn to do that, with time and patience—precious commodities in this day and time. Although I’ve used this assignment with many students, I have had the opportunity to use it only once since starting this blog, and so the work of those most recent students in that very small class certainly led to the examples I used here. They deserve to be acknowledged: Taylor Hedger, Sarah Vermazen, and David Bates. I thank them for taking this assignment so seriously. An article based on this assignment appears in Journal of Music History Pedagogy 9/1 (2019), pp. 99-112.